The timepieces in the Panerai Luminor 1950 series are a modern interpretation of the original 1950s military watch. The current top models in the series are complicated timepieces such as flyback or double chronographs. When you see a Panerai Luminor 1950 for the first time, its crown-protecting bridge will immediately catch your eye. Anyone who is already familiar with Panerai watches knows that the crown-protecting bridge is a distinctive feature of the Luminor diving watch. But how is it different from the Luminor 1950? Connoisseurs know that the 1950 models feature the engraving "REG. T.M." on the top side of the bridge. Moreover, the case sides have different designs: The Luminor 1950 has more pronounced curves. This design is reminiscent of a 1950s Panerai design. With a standard side of 47 mm, these wristwatches are 3 mm larger than "normal" Luminor watches. However, there are smaller variants available such as the Luminor Marina 1950 3 Days Automatic Acciaio, which also functions perfectly as a unisex timepiece with a 42-mm case. How much does a Panerai Luminor 1950 cost? 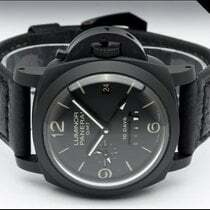 Prices for a Panerai Luminor 1950 start at around 4,400 euros for a pre-owned watch in good or very good condition. On the other end of the price spectrum are rarer models such as the Luminor Submersible 1950 3 Days Bronzo, which can cost up to and over 30,000 euros. Models made of 18-karat red gold cost more at around 20,000 euros new. If you prefer a model reminiscent of 1950s vintage watches, then take a look at the Luminor 1950 3 Days Acciaio (PAM00372). This timepiece only has two hands for displaying the hour and minutes, keeping the dial simple, uncluttered, and easy to read. The dial has a characteristic Panerai design: thin indices with Arabic numerals. 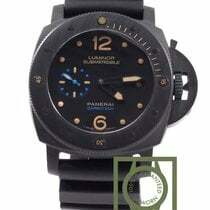 Its sandwich dial is another distinctive Panerai trademark. Sandwich dials are comprised of two discs set together, with the top disc featuring cutouts to make the luminous sections of the bottom disc visible. The timepiece is powered by the in-house caliber P.3000, which runs for three days after being fully wound. The manual watch comes with a dark brown calfskin strap. If you're planning on selling the watch later, then you should replace the original strap to keep its resell value high. You can purchase a Panerai Luminor 1950 3 Days Acciaio in very good condition starting at around 5,600 euros. New, the watch costs 6,300 euros. There are also chronographs in the Luminor 1950 collection, such as the Luminor 1950 Regatta 3 Days Chrono Flyback Automatic Titanio (PAM00526). This timepiece is a flyback chronograph with a regatta countdown, a feature which mainly appeals to yachtsmen. The feature helps you position your boat close to the starting line right before a race. The titanium watch's case is 47 mm in diameter and waterproof to 100 m (10 bar). Thus, it's not a problem if you want to jump into the water after your race. The in-house caliber P.9100/R is made of 328 components and has a three-day power reserve thanks to two barrels. The price for a new model costs around 12,000 euros. If you're a regular traveler, you've probably thought about buying a GMT watch at least once. These timepieces display a second time zone in addition to the local time. The Panerai Luminor 1950 3 Days GMT Automatic , available in stainless steel or scratch-resistant ceramic, has this feature. Its case measures 42 or 44 mm, and the watch is powered by the in-house caliber P.9001. The 42-mm stainless steel watch (PAM00535) costs around 6,200 euros new. The 44-mm version (PAM00320) costs 5,400 euros pre-owned and around 6,200 euros new. You can purchase the ceramic Luminor 1950 3 Days GMT Automatic (PAM00441) new for around 8,000 euros. If you decide to invest in a pre-owned model, you can save over 1,000 euros. The model with reference number PAM00576 has an 18-karat red gold case and, thanks to its manual in-house caliber P.2002, an eight-day power reserve. New, these gold watches cost about 20,000 euros. One of the most modern Panerai models is the Luminor Submersible 1950 Carbotech 3 Days Automatic (PAM00616). This watch's most remarkable feature is its carbon fiber case. Thanks to its rotatable bezel, which is also made of Carbotech, you can always keep an eye on your dive time when underwater. The timepiece is waterproof to 300 m (30 bar), and its in-house caliber, the P.9000, ensures a three-day power reserve. 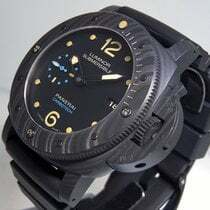 Prices for a new Luminor Submersible 1950 Carbotech start at 13,300 euros. Panerai fans are incredibly fond of the Panerai Luminor Submersible 1950 Bronzo , which has developed into a collector's item. There have been multiple limited editions of this model, which was first introduced in 2011 and sparked the bronze watch trend. 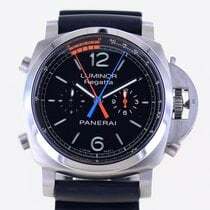 The PAM00382 model was limited to a run of 1,000 and costs about 30,000 euros; when it originally came out, its list price was 7,600 euros. Its successor, PAM00507, was introduced in 2013. 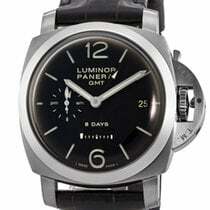 Today, the prices for a PAM00507 start around 26,000 or 35,000 euros for a pre-owned or new model, respectively. In 2017, the third generation of the Bronzo (PAM00671) was released at a list price of 14,000 euros. Now, however, you'll need to plan on spending over 30,000 euros if you want to call one of these new Bronzos your very own.